I realise I'm doing these posts in a bit of a weird order - hen do, honeymoon, then wedding - but I'm leaving the best till last (i.e. WEDDING PHOTOOOOS). 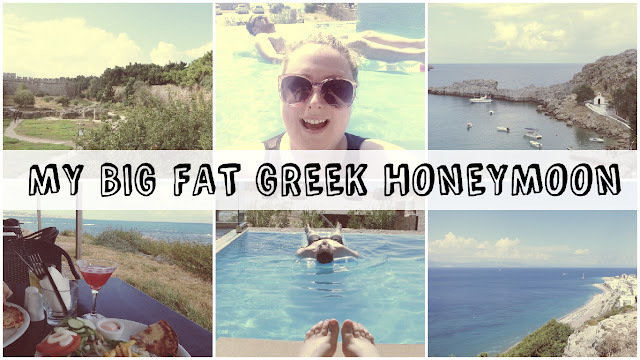 Before we get to that, I want to tell you all about our amazing honeymoon in Greece. We were staying at a hotel called Boutique 5 in Kiotari, on the east coast of Rhodes, not far from Lindos. The hotel was beautiful - an adults only paradise with great views, great food, and fantastic staff. We were in a suite with a private pool (oh YEAH!) which was pretty much the best thing ever. 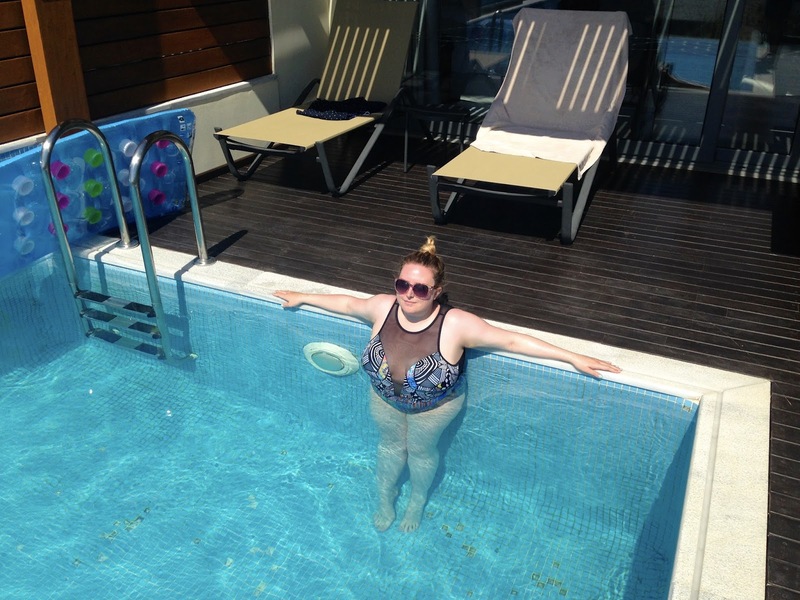 We spent near enough every morning in our pool - well apart from the first day due to the rain/thunder/lightning (Greece, what you playin' at?). Our routine was that we'd go for breakfast, come back and let our food digest a bit lying on the terrace reading our books, then we'd jump in the pool and spend a good few hours there. We bought ourselves a lilo on the second day and had a great time taking it in turns to lounge on it in the pool before being tipped off. 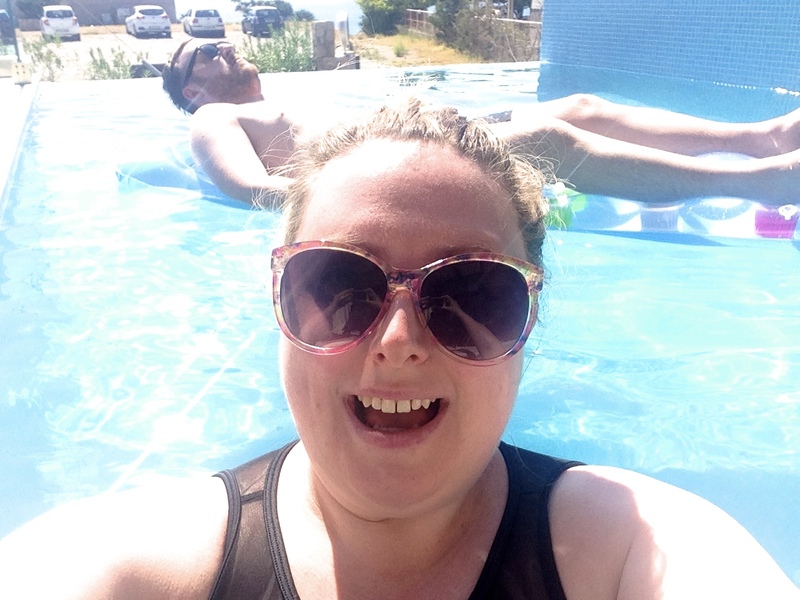 I uploaded a holiday video to my Youtube channel which contains quite a lot of sped up pool footage which, if I do say so myself, is hilarious. Back to our daily routine, mid-afternoon we generally took a jaunt into town to pop to the supermarket for water and snacks (got to keep stocked up on them snacks) and to wander round the souvenir shops. Both of us treated ourselves to a couple of genuine designer goods (lolol) during the trip - a Michael Kors purse for me, Beats headphones and Converse for B. For such a small town there were actually quite a few little shops to visit, and weirdly, at least 2 of those fish spa places (that fad still going strong in Greece apparently). Back at the hotel, we usually ventured out to the main pool, beach or indoor pool/spa in the afternoon. The hotel was a complete ghost town during the day so both the indoor and outdoor pool were always empty. I think most people either stayed at their own private pools, or chilled out at the beach as we honestly only ever saw 1 or 2 other couples at the communal pools. All the more space for us! I mentioned earlier that we'd bought ourselves a lilo for our own pool, well our water based fun didn't stop there as we came up with a couple of pool games to keep ourselves entertained. The main one being "Water Taxi" which involved carrying each other from one end of the pool to the other (without drowning), complete with taxi driver based patter ("had a busy day?"). Another favourite was "seeing how long you could drift on your back without drowning/banging into the side". Just you know, standard activities for 30 year old adults on their holidays. As we were staying on a half board basis we ate dinner at the hotel most nights, with the exception of Saturday (which I'll go into in a sec). The food at the hotel was great! We had our pick of two 4 course set menus every night, or alternatively we could put 30 Euros towards our choice from the a la carte menu. I went for the set menu a couple nights, with us making our way through the a la carte menu the rest of the week. There was a lot of choice and we didn't have one duff meal - everything was spot on. I enjoyed trying a couple of new foods too like veal (although I'm not sure I'm morally happy with that!) and a couple of Greek delicacies that I can't remember the name of now (like a sausage-y thing? Descriptive!). On the Saturday night we decided to do something a bit different and booked a table at a little family run Italian restaurant in Kiotari called Capi Di Pizza which I'd found on TripAdvisor. This was without a doubt the foodie highlight of the holiday - the whole meal was bloody delicious! Honestly some of the best pasta I've ever eaten, and a mouth watering tiramisu that had a dollop of Nutella on the top. Y-U-M-M-Y! The staff were so lovely too, and we actually ended up getting a lift back to our hotel by the owners' Uncle! You wouldn't get that kind of service in the UK! Being big fans of an itinerary packed city break we couldn't let the honeymoon pass without a *bit* of sightseeing, so on the Thursday I'd booked us a half day tour of the island online. Our driver Stergos picked us up from the hotel at 9am and drove us up the East coast, stopping on the way for a few photo ops. He was ace - telling us lots of interesting stories about the island and its history, and just general chat about his life and family. Such a lovely man! The main part of the day was a tour of Rhodes Old Town. Stergos dropped us off with some directions and gave us 2 hours to go exploring. The walled old town is beautiful, with so many things to see (including plenty shops and places to eat and drink). At one point we actually got lost for about half an hour or so in a maze of shops trying to find one of the 20-odd points of interest ("where are all the attractionnnns??? All I can see are shops!"). After a quick drink break we met up with Stergos again to continue the tour. Before heading back down the coast we went to the most Northerly point of the island where you could see across to Turkey - I didn't actually realise how close it was, but apparently holidaymakers often take boat trips across for a day trip in Rhodes (in fact, Blair remembered that he actually did this on a holiday as a kid). On the way back to the hotel we stopped at a viewing point for Lindos and St Pauls Bay - both absolutely stunning. We did consider going back to Lindos for the afternoon later on in the holiday but our laziness won out and we decided to stay at the pool for the rest of the week instead. It was nice do a bit of sightseeing, but I did enjoy having such a relaxing holiday for once. I read like 5 books! I can't remember the last time I did so much reading! In fact, I might write a honeymoon book review blog post, if anyone be interested in that? We've got a (surprise) weekend away for B's birthday coming up next weekend though, so at least that's something to look forward to! Check out my vlog of the honeymoon here! Yes! Book reviews book reviews!